With hypnotic flows, refined lyrics, and excellent taste in production, Maxo Kream is the total package. Directing traffic in double-time over an apocalyptic Mitch Mula production, Maxo delivers a raucous party anthem on “Go.” Aided by the booming-voiced Houston upstart D. Flowers, whose dramatically raises the video’s energy level when he elbows his way to the foreground, Maxo brings out the block for the new video, mobbing in Southwest Houston with a gang of twenty good friends and a few junkyard dogs. Premiered by WorldStarHipHop, “Go” is the latest visual off Maxo’s acclaimed debut album. 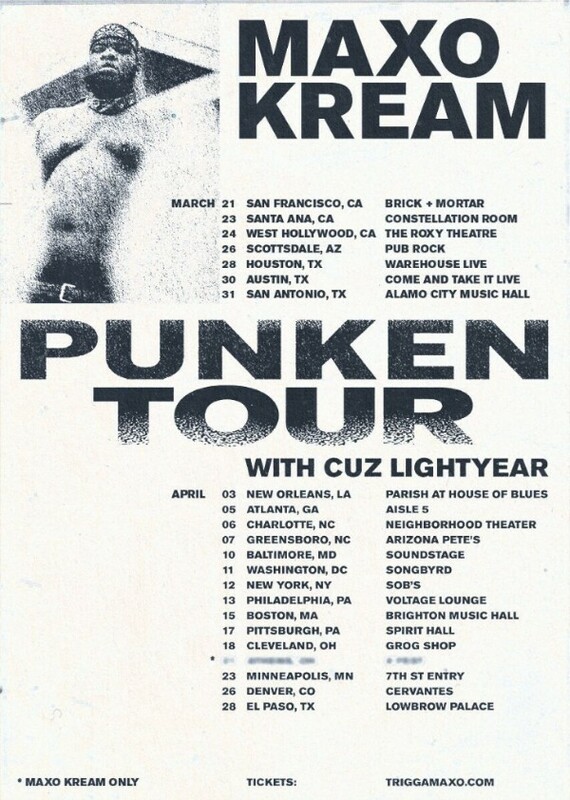 You can catch the Houston emcee on the nationwide Punken Tour, which kicked off on March 21st in San Francisco with a total of 21 stops supported by Cuz Lightyear. Tickets are available on Maxo Kream’s website. Please contact Michelle or Dharmic if interested in talking with Maxo Kream. Upon meeting him, gangsta rapper isn’t the impression that most would get from buzzing Houston emcee, Maxo Kream, age 27. He has a surprisingly goofy and playful demeanor, often cracking self-aware jokes and displaying a smile which showcases either his gold grin or his trademark gap in the upper row of this teeth. But, make no mistake, Maxo’s backstory is a tale consisting of crime and death that would catch the attention of the most jaded followers of gangsta/trap rap. Inspired by his college trip to SXSW and the fact that other street cliques throughout Houston such as FDAB (founded by late rapper T.O.Y, a childhood friend and Crip associate of Maxo) and MashMode (which has now resulted in the buzzing careers of Houston rap duo, The Sauce Twinz) were transitioning into music as a form of expression, Maxo and his younger cousin Lyndon (rap moniker Lyndo C), jumped into music. Maxo Kream’s sophomore project, #Maxo187 garnered attention with its unrelenting lyricism and exceptional production. With big name features and unmatched confidence, Maxo intends to show that he can compete with any emcee in the game.